It's clear city native U.S. Navy Lt. Thomas Conway, the last American chaplain killed in World War II, is a hero. 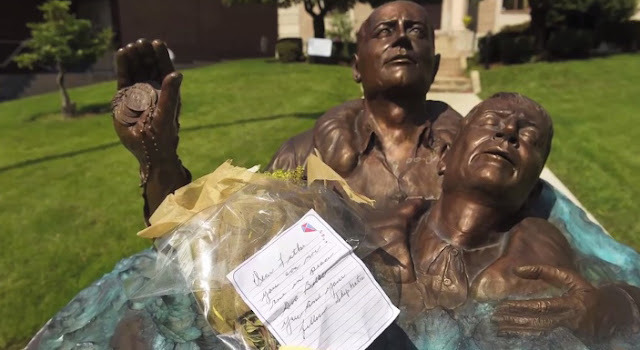 In the three days he lived after torpedoes sunk the USS Indianapolis on July 30, 1945, survivors say he swam among terrified fellow sailors and marines encouraging all not to give up as they floated day after day without food, water or shade in shark-infested waters. Conway died on Aug 2, 1945, three days before rescuers arrived. His body slipped out of his life jacket, lost in the sea as were the dog tags he had collected from dead shipmates. Sharks killed many pitched into the water. The ship lost 879 of its crew of 1,196. Only 317 lived to be plucked from the Philippine Sea. Nineteen are still alive. "Father Conway helped us pray," USS Indianapolis Survivors Association secretary Peggy Campo of Illinois recalls her late father, Don McCall, a survivor, said. "Hell yes, we prayed." But the hero priest has never received a medal for his sacrifice.